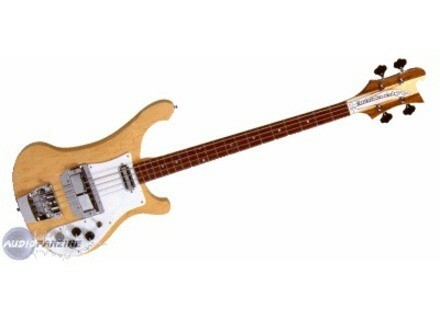 4001, 4-string bass guitar from Rickenbacker. The Rickenbacker 4001 -- no longer in production, though distinct from its replacement the 4003, so they say, only in its slimmer neck profile -- is really the classic non-Fender bass. It has two pickups, a three position selector switch, volume and tone knobs for each pickup, a foam mute for making it sound like an upright, and neck-thru-body construction that gives you tons of woody-sounding sustain. It was not a perfect design to begin with, and even the least-old 4001s are getting up towards thirty years now, so most of these are starting to show their age. Mine, a 1974, was in rough shape when I got it. I replaced the tuners and pickups and put a new pick guard on it and now its all I could dream of, except for the fact that the bridge is kind of wonky and has a habit of sliding a little bit, messing up intonation. With the new tuners, though, the thing stays in tune for hours of playing, which it certainly did not do before. If anybody has one of these and it won't stay in tune I highly recommend the Hipshot tuners, which will not require any drilling. The difference in tuning stability is night and day. It is the best feeling and easiest playing bass for rock, period. The neck is too good to be true. It's true that there are minor tuning issues, but these can be overcome if you know what you're doing. The trade-off for sound quality and playability makes it totally worth it. 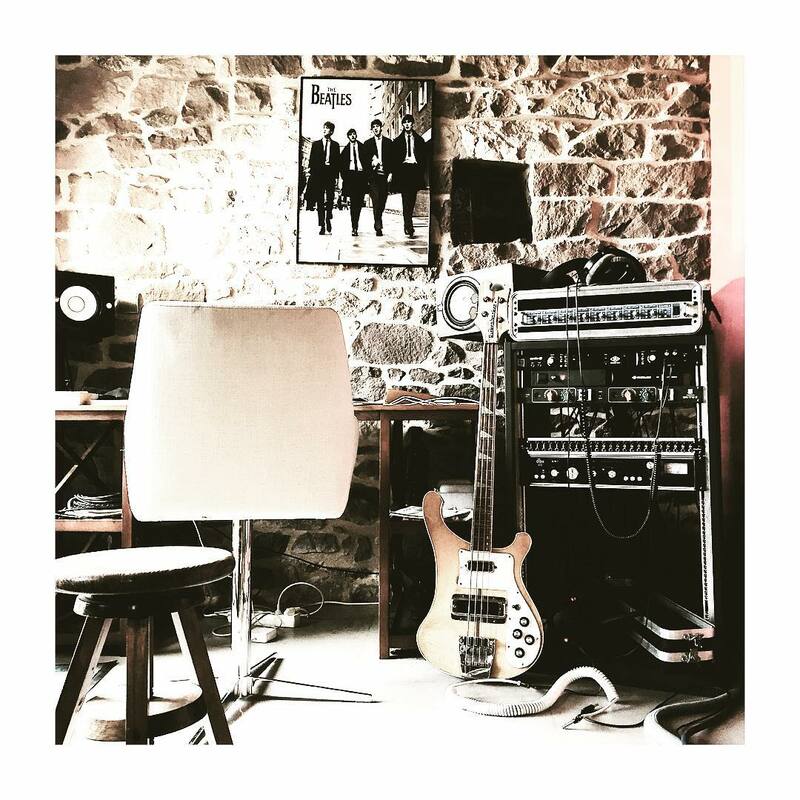 First of all, go listen to &quot;A Little Help From My Friends.&quot; If you like that bass tone this is the bass for you. A few things to consider, though: First of all, I think this bass sounds a lot better with flatwound strings. Not everybody likes flats, so if you don't like the feel you may be better off with a Fender. 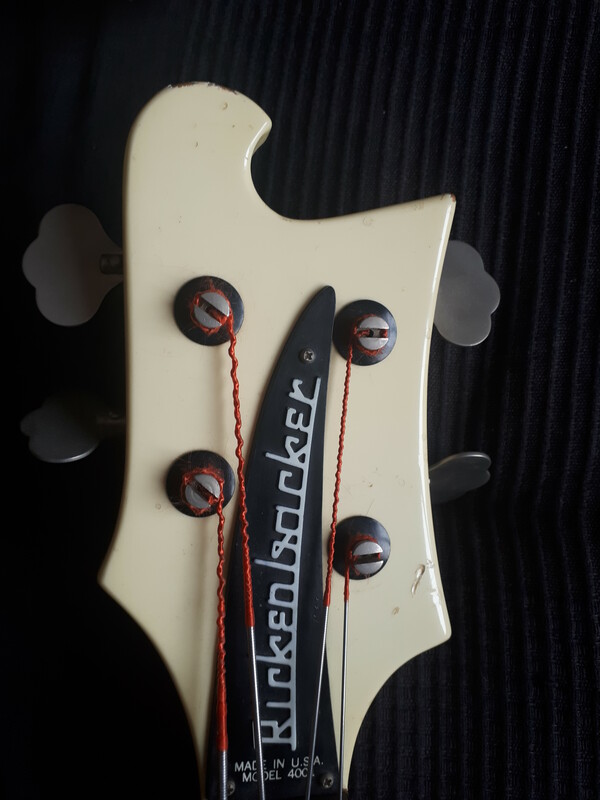 Second of all, the bass has a very up-front sound, very crisp and detailed (like most Rickenbacker products) and if you're running a solid state rig it may end up sounding a little too thin. I used to play through a solid state combo and didn't see what the fuss was about with this bass, but when I started playing bass more seriously (I used to be just a guitar player) I invested in an Ampeg tube head. Again, the difference is incredible. This bass was designed when tubes were the norm, and a good tube amp will really round off the edges of the tone while emphasizing what makes the bass so special. I should say a few things about my setup. 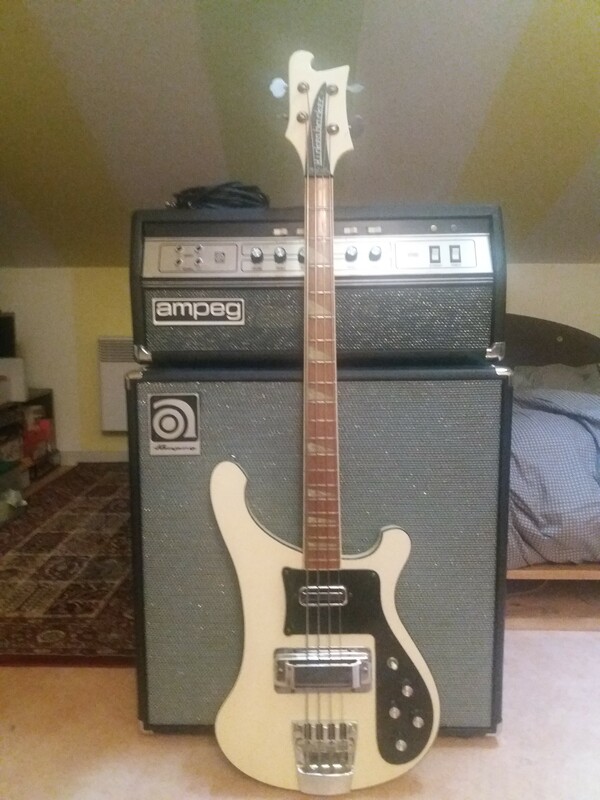 I have a seventies Ampeg V4B head and a new (made in USA) 8X10 Ampeg cab. The pickups in the bass are Bartolinis, though I used to have the original 1974 stock pickups in there. The Bartolinis sound the same except louder and clearer -- less muddy and less noise but the same tonal balance. My theory on this bass is that the sound is in the wood, anyway. The stock pickups sound great, and basically everything I've said about the instrument would still be true with the stock pickups. Running this thing through an Ampeg tube amp will give you the best possible bass tone for any style of 1960s or 1970s rock. 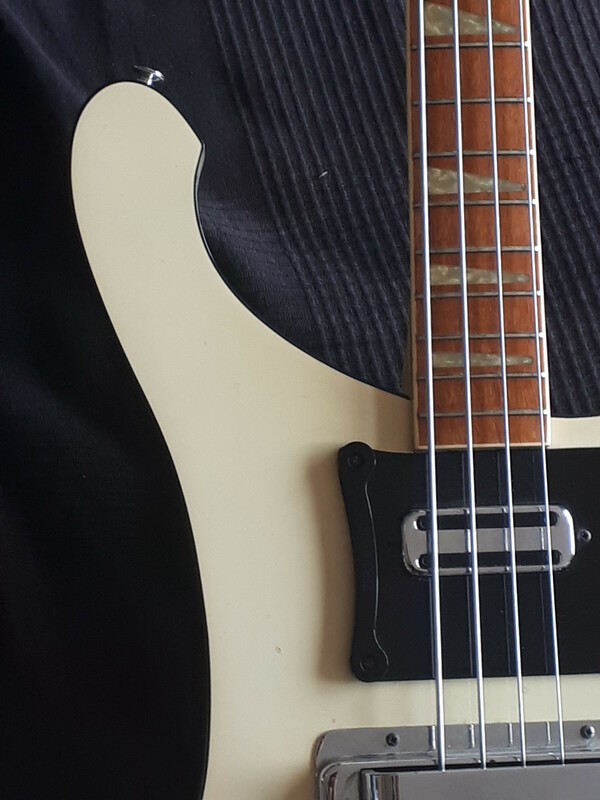 Zbinbass's review (This content has been automatically translated from French)" Unmatched efficiency"
Signature Chris Squire made in the USA. Passive bass, simplified 4001 (finished stereo) but much éfficace as the original (I can talk I had both simultaneously) who was qualified, although nearly perfect, a little too medium. Incomparable handle adjustable in all directions thanks to a clean Ricken with a double rod adjustment could not be more efficient. Enough but not too heavy, which gives a good grip. Bridge placed above the pickup which can gener some, but easily removable, it says it deals with it easily. CAUTION compared to a classic 4001 protection is mounted differently on Chris Squire's removal can result in permanent deterioration of the micro when reassembling (contact me for more info 0662438033). Suitable to any style, very versatile. No effect recommended when you have such low we keep the natural sound, turn it would be sacrilegious. This is an incredible bass, a truly unparalleled sound. I play on Trace Elliot triple body, but you sound out of any amp rotten, it always fits. Neck-maple / walnut, rosewood key "rosewood"
Channel trs trs fine and fast, very easy Access in acute. Lower a bit heavy but the quality is the appointment and the form is superb. Its unique "Rickenbacker" low standards, pops and clear treble. The simplest things are really the best! I play mostly rock, so it's done all the style of this low. A deprecated to slappeurs crazy. Plugs into my ampeg is the best sound in the world! Powerful, Submitted, rich ... happiness! Attention, I RPET that such low not please fans of ultra-modern techniques, like tapping or slapping. I think the best sound is obtained mdiator or with a strong attack on the fingers. We must "go inside", if not a not ring!